Call me on 07866 692 380 to secure your date today! If you’re looking for a childrens entertainer Gloucester then look no further! Whilst I’m based in Bristol I have been providing childrens party entertainment in Gloucester and Gloucestershire for over 10 years. My hilarious blend of magic, mischief and mayhem will delight children from the ages of 4 to 12 and give them a party to remember. A professional and talented magician, I’m a member of the International Brotherhood of Magicians and the Bristol Society of Magic and am fully CRB checked and have full childrens entertainer public liability insurance. 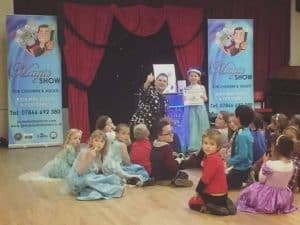 I’ve provided childrens entertainment at several venues in Gloucester over the years – Down Hatherley Village Hall, Sandhurst Village Hall and Quedgeley Village Hall to name a few so I’m very familiar hosting childrens parties in Gloucester and the surrounding areas. So if you’re looking for one of the best childrens entertainers in Gloucester to give you and your child a stress free party to remember please submit your enquiry today – I get booked up very quickly! If you’d like to read some of my amazing reviews take a look at my Netmums page. Interested in booking me? Get in touch via phone or send me an email and I'll get you back to you as soon as possible! Pop over to my alter ego - Magic Man Bristol! Copyright © 2019 Incredible childrens entertainer Bristol – The Great Jaydini. All rights reserved.